Did you ever think about buying a fish tank? Fish Resort turns the fish tank into a fantastic, free online game! You take care of the most different and colorful fishes, you have to feed them and treat them with medicine, if they don't feel good. If you manage to keep the fishes happy and healthy, they will produce money and level your fish tank up. 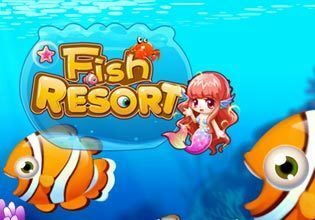 This will allow you to put more fishes in the tank, buy better food and give you access to even more colorful fishes.Take good care of the fishes, defend them against the evil shark and they will be loyal companions through all the hours of fun you will experience with Fish Resort.